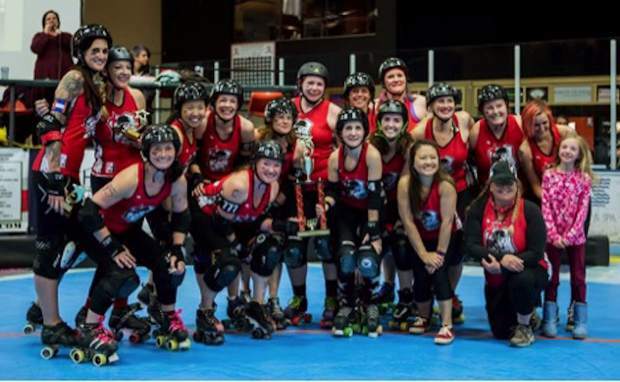 The Mountaineers of the 10th Mountain Roller Dolls will host five teams from across the country for the Melee in the Mountains roller derby tournament, a sanctioned event with implications for national rankings. Melee in the Mountains, a three-day event featuring a sanctioned roller derby tournament, returns to Dobson Ice Arena Friday to Sunday, April 27-29. The 10th Mountain Roller Dolls will host five visiting teams, and new this year will be an expanded schedule of events for the community. The tournament in sanctioned by the Women’s Flat Track Derby Association and influences national rankings. From 5 to 7 p.m. on Friday, get a sneak peak into the action with a free Mix-up Bout, featuring skaters from across the region as well as members of the home team — the Troopers. Following the action will be a community open skate as well as a meet-and-greet at Pazzo’s Pizzeria in Vail Village. Happening all day — from 9:30 a.m. to 7 p.m. — check out the bootie-blocking, juking and jamming action of sanctioned roller derby bouts at Dobson Ice Arena. From 9:30 a.m. to 5 p.m., this seeded tournament will include visiting teams from across the nation battling for national rankings. Tournament hosts 10th Mountain Roller Dolls Mountaineers welcome teams from Alaska, North Carolina and Pennsylvania, among other states. A cash prize is available during Saturday’s and Sunday’s halftime Chuck-A-Duck contest. Purchase a duck for $5 or three for $10 and test your chuck-it strategy to land the quacker on the target. The tournament after-party starts at 6 p.m. in Lionshead Village at Bart & Yeti’s featuring music from The Runaway Grooms on Sunday. For a complete tournament schedule, visit http://www.meleeinthemountains.com. The Antler’s Hotel in Lionshead Village will be offering discounted hotel rooms for tournament participants and fans.